Ferroperm-EMC is well known for extensive research and development of new materials and new components. The company has long-established connections to leading universities around the world and the support of key industrial partners. Ferroperm-EMC has just introduced a brand new range of Press fit Filters, including Feed through Capacitors and Pi-filters. 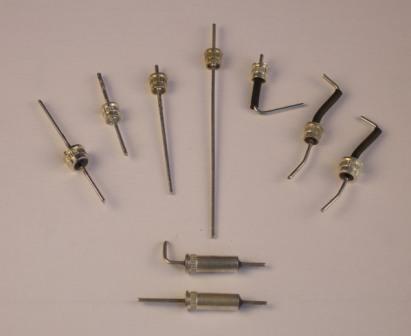 They are available in a broad range of capacitances, voltages and current. Please find information on these filters under "Products/Pi-filters and Feed throughs". Ferroperm-EMC is currently developing new low loss Nickel-Zinc-Ferrites to be used inductors in high Q application. The optimization of material parameters is controlled using Mössbauer Spectroscopy and Röngendiffraction, and stabilization and contol of the manufacturing process helps Ferroperm ensure a consistently high-quality technically advanced ferrite product. Our company is also developing a brand new range of surface-mountable pi-filters, which incorporate a simplified design permitting a wide range of material options suitiable for a broad range of frequency applications, working vltage and currents. Finally our comapny develops a range of hermetically sealed filters, especially designed for use in the millitary sector and in avionics.